It's Easter Sunday once again and today is the last day of the month and tomorrow comes April. This reminds me of my journey exactly a year ago I was in Biri Island, Northern Samar. I just want to check it out on my Facebook wall what I did last year and that was such a beautiful experience. I would never forget I had an injury while me and my guide was on our way to that rock formation, we walked through a water where the path was slippery and I had a cut in my foot. Totally the experience was one of a kind and during my trip, I took a bus from Cubao terminal off to Sorsogon City and then ride a jeepney going to a port where I had to take a ferry boat ride to Allen, Northern Samar. 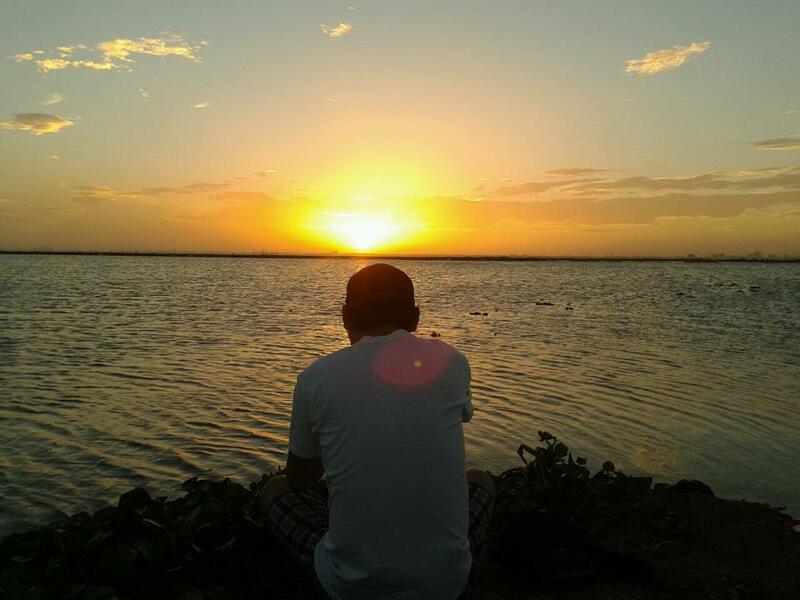 I just hope one day I could visit the place again. I met a doctor there, and we became friends as I added her in my Facebook account. In Biri Island, the electricity was limited and at 12 midnight the electricity is shut off and is restored at 12 noon. I had to recharge my laptop then just before the brownout so I could be online in time there was no light. I use a prepaid internet by my Globe tattoo for the internet. That time when I was asleep, I had this weird experience, I was in my alpha state and not totally asleep. It wasn't a dream too. Someone, sounds like an entity was on top of my body, like I was being raped by an entity. So what I did was I tried to fight for it and suddenly wake up. Just the other night, I had a similar experience but this time a lighter one. Was in the alpha state when someone was in my bed embracing me seems like the whole night through. I did not resist so it wasn't a bad experience, but something was really going on. Then when I was totally asleep, I experienced a night mare. I had a nightmare also about 3 days ago, prior to this experience. I guess someone from the paranormal world can explain about what I just had experience. So weird that it left me to question my experience. It's Holy Thursday once again and I did not have any out of town travel this Holy Week. Just stayed the whole day spending time in my room. As usual with my laptop and checking out the updates on my Facebook wall. I posted a lot of statuses especially when in comes to synchronicity of number sequences like my 11:11 experience. For some reasons I have to suspend my trips unlike in the last two years I spent my Holy Week in the island of Marinduque. I was thinking what to do in the next few days as my travel abroad is imminent. Maybe I would try to fix some of my important things, clean my room and spend some time with my friends and stroll at the mall. I really have to make up my mind big time. On this day reminds me of my travel abroad three years ago when I was in New York. That was an awesome experience when I had a "feel" what it is like to live in New York. I had my own room around $500 a month in Elmhurst and when you go out is a walking distance to the subway. Everything is within reach when you are outside, bake shop, restaurants, grocery stores and a walking distance going to the Filipino restaurant. Memories indeed and it's more fun to remember those good old days. I really want to live in New York given a chance someday and that is my dream, to live there. It's expensive though but worth it a try living in that big city that doesn't sleep. It is indeed an exciting city that you get a glance on a facet of your life. As what Alicia Key calls, "a concrete jungle where dreams are made of"-- and where dreams come true as well. But I know mine, did happen too. Smile! Anyway, at this time I won't have some out of town trips, I just want to focus and keep myself busy innovating my website. Will have to prepare myself to relaunch it and I would need some people to work with me as well. Will be very busy for the next two months to prepare myself for this grand relaunch. I just realized that there are new hopes, and there are lots of stars keep shining that guide someone in the path. We all have that in this life journey. It is only for us to appreciate it. And in our journey we need God's guidance. We pray and God will lead us the way. So this is all for now and God bless us all. Trust the Universe. No matter what happens, hold on have faith and don't give up. For the Universe is working on for the goods so that something that you have planned for will make it happen. It is tailored and signs and synchronicity will be abundant and tell you that something better is something to transpire. The Universe will not let you down when you know that your intentions are good, that you do not aggravate someone. Trust the Universe. Any positive thoughts will give you positive results. And if you trust the Universe, any negativity in your mind is eliminated. Believe and trust your heart, for the Universe will show you the way. Anything that happened bad to you, there's always a reason why it happened. Learning the lesson for pain is the greatest teacher. Once you have learned your lessons, and once you don't give up your faith, everything's good is underway to happen. Just trust the Universe. For adversities are just there in order to teach us how to become resilient. You will be prepared for the greater heights and you will climb up the ladder to reach the edge. Trust the Universe, and your heart will lead you the way. The Universe will give you what you need. For it has been proven in the past. It happened before that any wish is granted, and whatever you have planned for at present it will happen. You claim it and you have it. Trust the Universe and embrace yourself with love. For the Universe is the hope for all your worries. Because when you trust, your worry will just melt away and will be no more. We are the sons and daughters of the Universe. The Universe hear every cry that we have. Pray to God, for He is listening to you, hearing what you have cried for. Trust and give your best shots. For the Universe will be working with your thoughts and actions that you have planted. You are the master of your own thoughts and actions. For what goes around comes around. Before I slept at two in the morning, the first thing that came on my mind is to update my blog before the sunrise, and yet it never happened. I wake up at 6 a.m. so I had a coffee and puffed two sticks of cigarette. I don't really smoke though, except for some reasons when I am stressed out. When I used to work in a call center, I smoke a lot and drink coffee a lot. Smoking was just quite and I don't take it seriously. 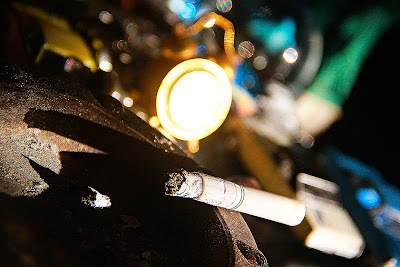 So I took the photo of my cigarette in my table and just to have a bit fun, I posted it in my Facebook account. I love when somebody hit the like button and comment on my photo, haha. Anyway back to the blog that I was supposed to write, I have never come across to any particular topic except anything that I can think of in the period of writing. There isn't so much travel for me this year because otherwise the moment when 2013, I could have spent some time in the out of town places. Unlike for the last two years I was so much blessed with more travels both for leisure and reflection. Everything happens for a reason why I may not have some local travel this year except in the nearby towns like Angono and Binangonan. But I wish that this coming Holy Week, I would be able to spend my time in Boac, Marinduque, just like in 2011 and 2012 for Moriones Festival as part of my reflection. 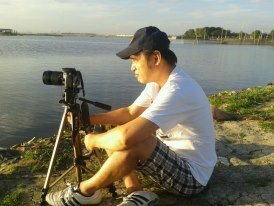 I am hoping the Lord Jesus will give me this privilege again to spend time in this small island. Surprises may come that we won't know anything yet which the blessings that I am about to receive from the Universe. I am getting ready for my next travel destination this year, which I am gonna spend my time in other country, and maybe that's the reason why I do not have much local travel this year. Just before writing this introduction, I have no idea what to write about then all of a sudden, I have come across to write about the shining moments in our lives. We come to a point that part of our journey within is to seek out for what we call "success" in everything that we do in our lives, because everyone is really hoping to achieve something that we can always be proud of. That spectacular shining moments in our lives just come, and sometimes it comes when we are least expecting it. Considering that we have worked out everything in order to achieve success and put us in greater heights. And we also come to a point that in this journey, in order to shine, the uniqueness that we have is the one that bring us to shine as bright as the stars in heaven. Something that we would want to achieve the best way possible as we would wait this moment to come. But the true shining moment does not only manifest from what we do in our lives. Shining moments means you shine within. From the internal to external that people see you as someone who can shine, without being dependent to the success that we have achieved in life. It is who we are, the true self that really shines. Achieving success is an external factor which contributes to make us a person that we want to be. We can still shine though, even we lack that factor that we see from most of the successful people. The rich and famous, the celebrities, politician, entertainers, businessman, these are the people who have shine externally and perhaps because of the status that they have in life. But what about us, people from the bottom, not known at all. I think that the Universe is not biased at all. The Universe makes sure that we also enjoy that shining moment. We need to take care of the light that we have, to maintain that equilibrium of shining. We don't need much golds as we are conditioned that success come from these material things. No it doesn't. It s the true self that really shine to each one of us. There may be some inevitable periods in our lives that we experience problems in our life journey. Everyone has it, with no exception thus leaving us some bits of emotional pains. One of the lead cause that affect our emotions usually are financial breakdown or we may experience some relationship problems with our loved ones. Depending on the gravity of the case, this causes us to grief that we have the need of finding someone who can understand us. Advice from friends and loved ones are just be there, but to empathize is a different story, only few people does it. In some degrees, we may find ourselves in difficult times that we seek moral support but sometimes it may be surprising to know that the people you expect to give you that moral support are ones who will decline you. It may depend on the reasons though as some people may not have time enough to look into your problems. You are needing time from them, care and understanding that these one are the short comings you have experienced from the people you cared most, especially friends. You can't blame them and life is just like that. But the most painful situation lies when you are on your highest peak, some people would love you, look up you and treat you nicely. But comes when you are down and find yourself at the bottom, you will know who your true friends are. You will know who will give you the moral support that you are needing most. It is best to know who are the real one, someone you can lean on when you are at your darkest hour. After all, these are the people who will unconditionally give you a helping hand when you need them most. But we come to know that if there is, our Lord Jesus is the Real One, a friend, our savior who will never leave you in good and bad times. He will always be there in our hearts waiting for us to call when we need Him most. Since the other day I've been digging my old boxes where some of my things were kept. I never touched based with my old stuffs for over a year because from then, I never had the chance to take a look at it. So I did had time already and I came up with some of my small collectibles like match boxes, brass angels, souvenir items, coins, playstation game guide, glass and many more. These are some of the old things I bought abroad. Just today I found my notebook I used to write songs and obviously was covered by creases. These are just some of the jewels that I cherish most. These things remind me of my random pasts, things that I value that we can never go back to our pasts but have the pleasure of reminiscing it. Well I haven't finish digging my old boxes yet and let me see again if I can find something interesting. Sometimes it is easy for someone to write something that could enlighten the reader. It could be in a form of advice but some people may be able to resonate or relate to the message. To some people who have gone through emotional pain, some messages are less important. They would only need people to understand their situation and that they would never want an advice. To the one who have experience the adversities is a difficult situation to be with, especially when the emotional pain pattern overcomes the body and mind totally. So they could hardly relate to the message from their acquaintances or peers. That is why I find empathy important than advice, even when a person is not into their shoes. Because if it is an advice only, any person can do it, even the little kids can do it but only few people can empathize with the situation. Some people have a good emphatic skill when they can easily empathize and some people are good on advice when they can give sound and good insights to the people's situation. You probably tried your best to fit in to some people and perhaps you are longing to make some friends with them. Unfortunately, no one seemed to care about you and you feel that you are an outcast, that they seemed not really care about you. Each of the effort that you did to please them did not work. And perhaps the reason why you want to please them is because you may like them. Sometimes, things are one sided and the goods that you do are not appreciated and you are being overlooked with the things that you did for them. It creates questions to yourself that you might end up to say that is there something wrong with yourself. In this way, this is not an issue about giving or receiving. Not issue that you are a giver and should not expect anything when giving as what others insinuate. There may be some different reasons of why they couldn't really come across your friendship, in spite of your goodness. But personally I wouldn't know these reasons are. You are just being FLEXIBLE and you can always adjust to any kind of personality that you may have encountered. But to the people who may seemed to be "choosy" perhaps they could not relate on you, and maybe they have a different likes they are looking for some criteria in order to fit in to their tastes. Sometimes the friendship are being compromised in spite of having a "like-minded" or similarities with them. But we don't really know the reason behind. And when you are practicing what is ought to dismantle your ego, you might probably think that sometimes if it is deemed necessarily, you may have to use your ego to shield yourself from being vulnerable. And this could be probably a good defense to protect own self. So it's not always bad to say or do, when people doesn't like you, you can also dislike them. This is a normal actuation use as your own defense. I opened my laptop today and when it started it showed my picture sitting with my face smiling. This picture was taken by one of my school mates in the I. T. school who is also a photographer taken in one of the universities in Quezon City during summer last year. Then I thought to myself, that this photo was almost a year ago. I look at my own eyes, usually they said that I have a cheerful eyes and that seemed I saw the beauty of myself. I do not toot my own horns but when I stare my whole self in the picture, I saw the beautiful things I have done. That I was so happy with the things I did in the past, that I was proud and that I did no wrong that made people put in a hot scene. These were the things I would consider that I will always remember about myself. Sad at the same time that it made me cry because it reminds me about the journey I have partaken throughout the past years, and the year I started to draw in my spiritual path. Pictures are a token of remembrance of who we are. We can see ourselves both internally and externally. It speaks about you and when you look into your eyes where it is the window of our soul, you will see your true self. Normally what we see in the pictures are the memories in that moment and we yearn about it. But there is a deeper value when you get to see more about it. Maybe it's about who you are, where you have been, what you've become, and the struggles you have partaken. These are the facets in my life when I saw my picture in the computer. Not just about that single moment but the deeper things I have come across throughout my journey. It brought me to my pasts thought, that it made me sentimental as my eyes became teary. Now, I was given a chance to start anew. The Lord was so good to me that sources came in the least that I expected it. It the midst of my adversities that I see light in it. The Source knew what I was needing and this synchronicity just worked within my reach! The Lord knew that I did no wrong. Yes I was not perfect but somehow I never tried to put someone down for my own gain. Then I remember that "white feather" that fell to my skin few months ago. Now I can see that sign, I can see that hope the angel has given me that my angel my prayers were heard. So that picture of me will also serve as my inspiration reminding me of who I am and the path I have already partaken. 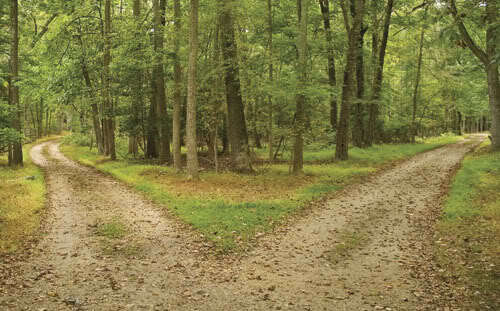 Do you really need to choose the path so you can make it right and reach the right direction? Probably this could be one of your questions, or let's say my question too. I've been hearing a lot about choosing the right path that you may walk through, either you go right or you go left. But no matter what you have chosen, you will always reach your destination. Life is a test though, and everything that we do is part of the learning. Without these learning we will not grow and evolve as a human. The path that you may have partaken may look good, bad, wide or narrow. But depending on your choice, there's no guarantee that everything will be all's well that ends well. It's not just like that. We take it from the heart whatever directions that resonates us. And it's not about choosing the wrong path. Sometimes the one that we chose usually have some surprises. Yes life is full of surprises and you won't know what is going to happen. You can't figure out clearly which one will really lead you to something that is good. And life is a long journey. Whatever path that you have chosen, the most important thing that you have acquired is the wisdom, and the will to grow. So it's not bad if you have chosen the wrong direction. After all, we always learn from our mistakes. The road may be long, but in your journey you will meet a lot of challenges. Fear not, for they are there to bring you to another world. And when you walk through it and you reach at the end of the road, always be thankful to God. Say a little prayer, for He will guide you in your journey. No, it's not about choosing the right path, it's about the lessons that we have learned from choosing the path. When I am sad and looking for some answers, the Universe work in a mysterious way and it works for me through signs and synchronicity. With the things that was unveiled by the Universe, it makes me feel better from the emotional turmoil and confusion I had. It's just I want something that will unfold the truth to support my inner knowing. That truth that comes out supports my claim that until today my logical mind could not really comprehend. It's like you are being reminded to already use your common sense. As the information unfolds what I believe in, the Universe takes the initiative to believe and trust what I really feel may be true. I used the word "may" since at this moment my doubt still creeps on my mind. I was really feeling bad the other night that I was hopelessly becoming confused in what I really felt, but I got stumbled to something that I did not really expect to be unfolded. That made felt better, because all these moments I was seeking for the answer and yet everything seemed to be unleashed one at a time. It wasn't revealed to me in a single bundle. That's how the Universe works. The truth will not be unveiled in just a single serving. It will just come out from the moment when you are least expecting it, but the mind is the one making us confused, for it fights back to what our heart is saying to believe in. It made me happy though, but I wouldn't know how long will it just make me feel better. Or maybe, the Universe will give me another idea until everything becomes clearer. This is part of my soul's journey. Happy because of the truth within. Sad because, I haven't gotten the big picture yet. But one thing I have learned in my path is to trust the Universe and become patient as the Source is working on its way through the Divine Plan. But I wouldn't know yet how everything's gonna be. More importantly is how I felt that the Universe loves me and wouldn't leave me in vein. I trust God, that I know someday everything will have a clear answer. I have come across that the notion of the dark night of the soul is the light that is beaming inside our heart. Our heart is the chamber of God where He dwells that is holy and pure and this is where He communicates in us but our mind is the one preventing us to listen to the sanctuary of the inner voice. The inner voice in our mind differs for it is the one stopping us to listen to our heart and that is why the ego conditions us not to listen. There is a goodness that the dark can bring, no matter how dark it is, for there is always light, and God is Light. We can't see the light because of the ego keeping us apart from our heart. The fear based situation that our mind can bring allows us to let the darkness rule over our soul therefore making it difficult to see everything that is beautiful in the experience of a seeker. Dark night of the soul is sacred and the more you embrace yourself in the dark you are learning and respecting the sacredness of this inevitable stage. In my journey, there were times I've been pretty of much of my sentiments, hoping they can relate to me, hoping they can understand me that they won't keep their distance away from me, as far as to those people I look up to, believe in them but failed to reach out to someone like me and that was because of my orientation that they were more spiritual and perhaps achieved some degree of enlightenment. And that is because I feel a deep connection to everyone who are on the same path as me. There was a blame-game I have thrown to some of them. This was because of my confusion, the emotional turmoil I had, and that I had no one to turn to. I may be one of a few spiritual seeker to have experienced this stage and it feels like I was totally alone in my journey that no one can relate or understand what I was going through. Of all the pains I have felt I tried to surrender saying, "Lord, hindi ko na kaya, tama na.." and tried to blame Him for all the adversities I have gone through. I feel also that I can no longer resonate with most of the people who surround me and that everything I see in them is the ego in its highest form. And it seems that I can see and feel every single heart of a person whether he or she is sincere or not, lack of conviction, hatred and bitterness and if someone who has a pure heart. It sounds weird that I can really feel their energy even in the chat room or in the Facebook wall. There's so much things that it is hard to explain and I myself is the recipient of this bizarre situation. There are times that I tried to rationalize that things happened to me was just a product of my imagination and that everything is alright, just to say that I am fine but ended in my corner of my room alone and weeping that I couldn't really cried hard enough. This is so because everything have collapsed in me, my hopes and dreams, mission-vision, aspirations in life and everything that I've planned for seemed not to be moving and have been stocked like a water in a stream. I have mentioned in the first part that I haven't been in the light yet and still experiencing the dark night of the soul. But I just realized that I am already experiencing the light in the darkness partially and is not yet able to see the light fully. I just realized that, when you are doing a humanitarian work, when you inspire others and concentrate on your passion, somehow the light is already beaming there. Sometimes we just don't notice it. We don't see it much as we can because all we see is the pain and the sufferings and our ego keeps on ranting and pulling you off from moving forward. In order to bring light to the darkness, God wants me to concentrate on my passion. I write in my blog site more often now, , I sing at times when I want to and I loved my passion in photography even more as most of these photographs are about the beauty of nature. Photography helps me to communicate to God and through nature I became closer to Him, and that brings me to the wholeness before we return to the source. That is the light in the darkness, I started to concentrate more about my passion, instead of focusing my mind to the ego-based business. You feel lighter and become more in a balanced state and the creation of music and the arts is what make a person understand about his true self more. With your passion you feel more connected to the Source and become one with the Source. We always have to look at the brighter side no matter what happens, and even if the luck turns against you. Because everything happens for a reason, circumstances are a learning lesson and if we embrace these adversities with open heart, it helps you move on a lot easier, lighter and guilt-free. The world is a stage full of ego and we have to deal with it every day in life, and you meet people who enter into your life, some people will stay and some people will leave. And whatever reason is, it make to a point that we get some pointers from them to learn a lot and become more aware of ourselves how we can change from within. This is how the Source works for our growth. And with so much more of these, we always have a continuous learning lesson and the pain and the sufferings that we felt is something that we can take as a basis why we change so much. So and when we are through the learning, we can now proceed to the next stage as soon as we are ready. The learning is a step by step process until you get it, learn how to accept anything that have come your way. There may be times that predicaments would come in a bundle and that the intensity was extreme to experience that you cannot hold on to it. This is just another way around and everyone has its own unique way to grow with the experience. Perhaps if someone is able to read this blog, you wonder why the title is "I Am So Proud of You, John." Basically it is about my experience why I have so much conviction to write more often in my blog. That this blog upon my writings, could possibly become eye-opener to those who resonates with me. I am not saying this can help you better but at least I have shared some of my experiences that have served me a lesson for my personal growth. So why am I being proud of me? First of all I will not be talking about my human accomplishment if there is, small or great. It is pretty easy to toot my own horn if I will be making some lists that I have done in the past. Proud because I am being of myself more, knowing myself of who really I am and the things I have partaken in my journey to enlightenment as a spiritual seeker. Proud because somehow with my human experiences, I was able to suppress my ego that is keeping me away from my relationship to our Source, blocking me to become balanced, as we integrate ourselves with God. I know my path is, my spiritual calling although I know that I have my free-will and could alter the journey. God is just only showing me the way and everything that happens in me, good or bad is just a further step to become closer to the Source. I have been persecuted and abused in spite of my goodness that I have shown to others and if that is the only way that could be at helped with them but the compassion that I have given them was unconditional although I felt it hurt me so much. I have learned how to accept failures and forgive those people who have caused me a lot of pain. Forgiveness takes a lot of time but the level of understanding has become wide open and there is a purpose why this happens becoming an instrument for their sense of necessity. I feel light, despite of what happened to me badly and I'm just proud about it. My finances collapsed, my mission-vision failed but the brighter side is the growth I have learned from this lesson is immeasurable and I have left an ego-based business which I have taken cared for over 5 years. This is not to vent what predicaments I have partaken in the past, I just want to share what are the catalysts for my spiritual growth that the purpose of what happened to me is about self acceptance and God made it to a point that everything happened to me was a sync in order to become One with the Source. I feel the connection that is undeniable and my inner knowing keeps on telling me about this. Dreams, signs and synchronicity were abundant and has already been countless. Proud that I have found myself within of who I AM and the Universe keeps on reminding me about myself everyday. I don't need to tell everything I have experienced if that is so, only the truth pops up in due time and it is the truth that will show things that that I don't really have to make a move and say it. The truth is just within. So the lists go on why I am so proud about myself, not everything will be said. And I am just being proud of who the real I AM. Today is the first day for the month of March and time is just so fast. When you say March in the Philippines, what comes to our head is summer. And that means also it is a vacation time that people spend time to travel to different places. That also means that Holy Week usually happens in summer. So what do I do when summer comes? I don not really have my own itinerary but there's always a plan that's not clear yet where to go. And usually when I think about summer, my mind is set to either spend time in Boac, Marinduque or Pasacao, Camarines Sur. These are just the places that I am used to go, because in Boac is where the Moriones Festival takes place and my late grand mother from father's side is Marinduqueno. This is the island where our entire clan had previously som getaways to observe either the Holy Week or the Mayflower event like the parade of Maria Elena. I was born in Naga City, Camarines Sur and as Bicolano/Ilonggo my family also spends time here on the beach side. I can now feel the hotness. So let me see what indulgence that I can do this summer. It's been quite sometime I haven't gone into the provinces so I think this is the best move that I can do at this time is to plan which place that I wanna go this summer.